2006 Pontiac GTOs. Lot 7 of 29. CLICK-> Justin only has 4,618km on his odometer. CLICK-> Close-up of the manual transmission shifter on Justin's 2006 GTO. The stitching on the leather is red. This also makes for a great desktop wallpaper; 800-600 wallpaper and 1024-768 wallpaper. CLICK-> Art Modyman is pretty good with a camera. Take a look at this shot of his Impulse Blue 2006 GTO. Art adds, "I purchased this in May of 2006. I have always wanted a GTO. I have owned eight 2nd generation Firebirds - four of them Trans Ams. I still own a 1973 Firebird project car with manual transmission. I have always loved Pontiacs." This photo was taken in Sequoia National Park, California. Like this shot? How about a version for your desktop wallpaper; 800-600 wallpaper and 1024-768 wallpaper. 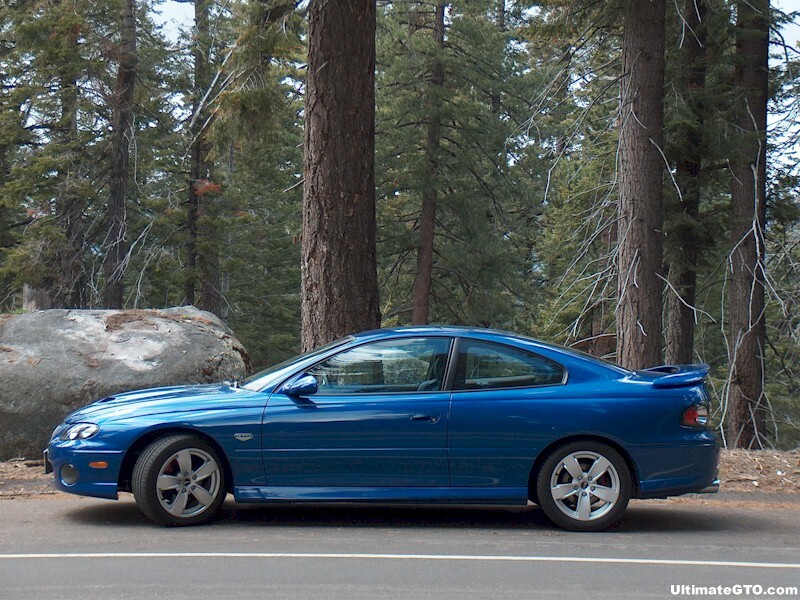 CLICK-> Another awesome shot of Art's Impulse Blue 2006 GTO in the great outdoors. Art is not afraid of leaving the paved road. This was taken in Big Bear, California. CLICK-> Art's Impulse Blue 2006 GTO at the ocean. Actually, the Pacific Coast Highway in Huntington Beach, California. The end of the Huntington Beach pier is in the background. CLICK-> We need more shots of GTOs like this! You would not believe the number of people who send us pictures of their beloved GTO in their garage. Their pictures are dark and most of the time only part of the car is in the shot. This photo was also taken at Sequoia National Park, California. CLICK-> Art's Impulse Blue 2006 GTO taken October 22, 2006 at El Mirage dry lake bed near Victorville, California. This place is in the Mojave Desert on the western edge of San Bernardino County near the Los Angeles County line. That day, the Southern California Timing Association was having a meet. There were 113 entries with 82 cars and 31 motorcycles participating. The fastest car that day went 263 miles per hour. The fastest motorcycle went 182 MPH. CLICK-> One final picture of Art's Impulse Blue 2006 GTO at the El Mirage dry lake bed. CLICK-> Spice Red 2006 GTO owned by Ryan Reddick from La Grange, Kentucky. Spice Red is a new color for 2006. Ryan adds, "I bought her back in June (2006) - we like to call her Billie (as in the goat). Been looking at these a while, but wife wouldn't go for it until we found this beautiful Spice Red Metallic. Now its a perfect combination - she thinks its pretty, I just think its fun! Now we just need to find my Father's old '65 and the garage would be a show place!" CLICK-> Spice Red 2006 GTO, right side view. That boat in the background is hot. I know nothing about boats, but that boat is hot. CLICK-> Spice Red 2006 GTO, front end view. If I ever had a boat, that's the one I want (in the background). I like the shape of the windows and stuff. CLICK-> Spice Red 2006 GTO with Ryan's boat. Does that say "SS Minnow"? CLICK-> Phantom Black 2006 GTO owned by Pat Reilly from Locust Valley, New York. Pat comments, "I bought my baby in late April of 06 after dreaming about it for months. The dealer had those rims on premesis. It was a dream come true! 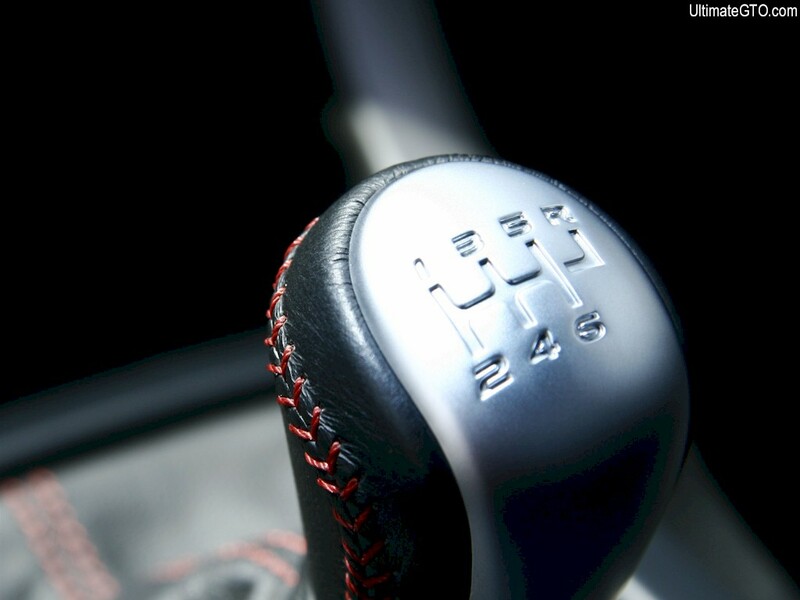 Also it's a six speed! I wouldn't have it any other way." CLICK-> Phantom Black 2006 GTO, front end view in the dusk.